Ratzel is unique in being a central figure in the late nineteenth century shaping of two major fields of knowledge: geography, and anthropology. Initially interested in chemistry and zoology and influenced by the evolutionary writings of Ernst Haeckel, Ratzel undertook several years of travel in Europe and North America as a journalist, and this gave him a chance to see first-hand how human beings had evolved socially, as societies, and in response to their environment. He began to sour on natural selection as a vehicle for understanding how humans reacted to and made use of their surroundings, developing his own framework (in part based on the migration/dispersal-centered ideas of Moritz Wagner) that became known as anthropogeography. Within geography Ratzel is generally credited as being the father of political geography (and perhaps of human geography altogether), though he also wrote extensively on physical geography and other subjects. 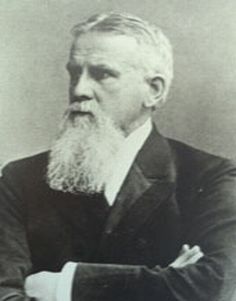 At the University of Leipzig he became the center of an intellectual circle (with Wilhelm Wundt, Karl Lamprecht, and Wilhelm Ostwald) who in sum had a profound influence on the thinkers of their time (consider, for example, that as a group they published some one hundred thousand pages of writings!). Ratzel himself was perceived in the U. S. as something of an environmental determinist among geographers for his framing of the "lebensraum" concept, but in fact his primary documents on the subject have only infrequently been read here, and the way the Nazis distorted his ideas for their own purpose cannot be taken to reflect their actual philosophical content and value. It is thus most unfortunate that Ratzel apparently died just as he was about to begin a critical re-examination of the whole of the subject of biogeography, as viewed through his lebensraum model--a great lost opportunity for the field, considering the scale of his earlier contributions to the study of political geography, ethnography, world cultures, and anthropogeography. --born in Karlsruhe, Germany, on 30 August 1844. --dies at Ammerland, Germany, on 9 August 1904. --Dictionary of Scientific Biography, Vol. 11 (1975). --International Encyclopedia of the Social Sciences, Vol. 13 (1968). --Geographers: Biobibliographical Studies, Vol. 11 (1987). --Bulletin of the American Geographical Society, Vol. 36(9) (1904): 550-553. --Annals of the Association of American Geographers, Vol. 61(2) (1971): 245-254. --The Makers of Modern Geography (1969): 62-72. --Friedrich Ratzel: A Biographical Memoir and Bibliography (1961). --Perspective on Ratzel's Political Geography (1983).